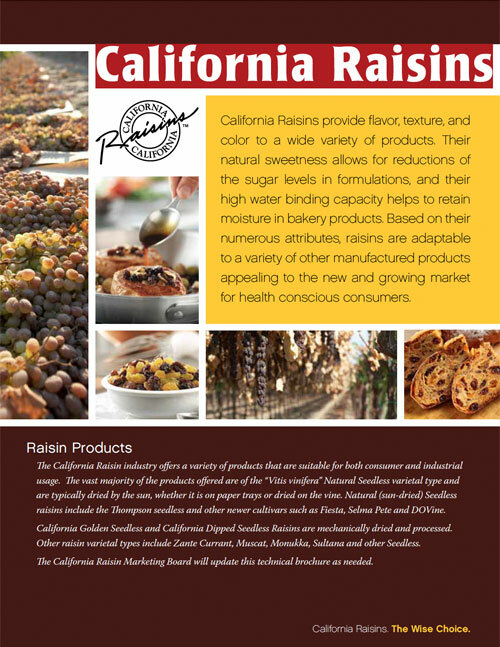 California Raisins provide flavor, texture, and color to a wide variety of products. Their natural sweetness allows for reductions of the sugar levels in formulations, and their high water binding capacity helps to retain moisture in bakery products. Based on their numerous attributes, raisins are adaptable to a variety of other manufactured products appealing to the new and growing market for health conscious consumers. Click image on right for PDF of the California Raisin Technical Brochure. Depending on connection speed this file may take up to 1 minute to download.